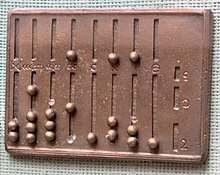 Bi-quinary coded decimal is a numeral encoding scheme used in many abacuses and in some early computers, including the Colossus. The term bi-quinary indicates that the code comprises both a two-state (bi) and a five-state (quinary) component. 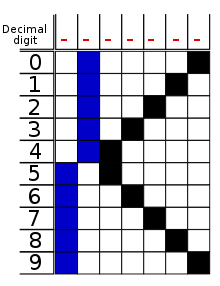 The encoding resembles that used by many abaci, with four beads indicating either 0 through 4 or 5 through 9 and another bead indicating which of those ranges. Several human languages, most notably Khmer and Wolof, also use biquinary systems. For example, the Khmer word for 6, pram muoy, literally means five [plus] one. The numerals from 0 to 9 in Japanese Sign Language is based on bi-quinary, with the thumb acting as 5 units, and the rest of the fingers each standing for 1 unit. Two bi bits: 0 5 and five quinary bits: 0 1 2 3 4, with error checking. Exactly one bi bit and one quinary bit is set in a valid digit. 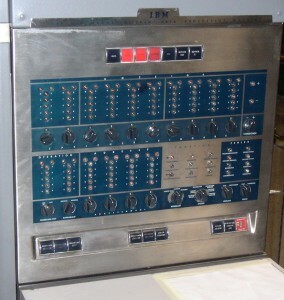 In the pictures of the front panel below and in close-up, the bi-quinary encoding of the internal workings of the machine are evident in the arrangement of the lights – the bi bits form the top of a T for each digit, and the quinary bits form the vertical stem. One quinary bit (tube) for each of 1, 3, 5, and 7 - only one of these would be on at the time. 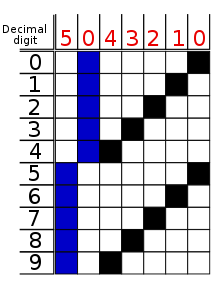 The fifth bi bit represented 9 if none of the others were on; otherwise it added 1 to the value represented by the other quinary bit.